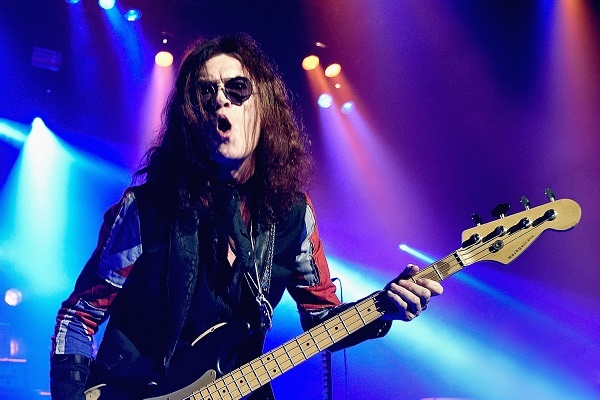 Rock and Roll Hall of Famer Glenn Hughes is on a massive worldwide tour that has him performing Deep Purple hits and special, deep cuts from Deep Purple’s extensive catalog. The trek, dubbed the “Classic Deep Purple Live” tour, hits the U.S. this weekend following dates in Europe, South America and beyond. For Hughes, performing the beloved songs of Deep Purple – songs he helped magically bring to light – is a thrill. On the road, Hughes and his band are one big, happy rock ‘n’ roll family. Hughes spoke with Anne Erickson of Audio Ink Radio more about this classic tour, his time with Deep Purple in the ‘70s and why he “spiritually, mentally and physically” is in the perfect place right now to do this tour. Anne Erickson: It’s great to see you doing this extensive “Classic Deep Purple Live” tour. What makes this tour special to you? Glenn Hughes: You know, I’ve never done this kind of a show before. Yes, I do some Deep Purple songs in my shows, but I’ve never done a complete show of music that I was involved in as a writer and architect. So, the question is why now, and the answer is that some things have happened to me so that now I’m in great health spiritually, mentally and physically, so now was a great time to go out and play these songs that the fans want to hear. Anne Erickson: How would you describe your time with Deep Purple in the ‘70s? Glenn Hughes: Well, Anne, you probably won’t remember this, because you weren’t around, but when you think about the ‘70s, I’ll just name some names: Led Zeppelin, Deep Purple, Black Sabbath, Pink Floyd, The Who, Yes, Genesis. It’s insane, because I loved American music and all the great artists that lived in America, but America was really grabbing a hold of the British bands that day. I was fortunate to play in a stadium band and play these songs in front of thousands of people. As a 21-year-old guy, I was pretty grateful to be able to do that. Anne Erickson: The music industry has gone through such an evolution since the ’70s. How would you describe the modern state of rock music and metal music? Glenn Hughes: I mentioned the names of the ‘70s bands, and those bands are iconic and Hall of Famers, and with the generation of today’s artists, I think metal is a different-sounding metal than it used to be. It used to be more organic, and now it’s a different sound, but it’s great, because the community of metal has kept the same vibe through the generations. I love rock and metal music and the artists– I think the rock and metal fans are the greatest fans in the world. Anne Erickson: What’s it like performing these Deep Purple songs for fans every night? Glenn Hughes: In order to play these songs, Anne, I’ve got to be on my game. I have to bring it. I’ve got to get a lot of sleep and exercise and do all the things I can to bring these songs to life every night. I’m honored to do this tour, and it’s a long tour. We’re nine months into it, and there’s another 18 months to go. There are going to be three American tours in the next 15 months. So, I’m grateful to bring these songs to America, a place where I call home. I’m an American citizen now, and I’m very happy about that. Anne Erickson: You’re on this tour for a long stretch, but after that, what’s next for you? Glenn Hughes: I’m in a band called Black Country Communion, and we always make albums. We don’t do a lot of touring, but that may change in 2020. I think we’ll make a new album and hopefully do some shows. What I know is that I’m going to be playing and singing, because I need to do that. Primarily, because I love to sing and play music. That’s what I love to do most.